Have a dream that inspires. Nurture your ability to embrace differences. Seek out challenges--scale one mountain after another. Face challenges that matter— learn to "fight with real swords." These and other lessons were the constants in the life of Konosuke Matsushita, founder of the Panasonic business empire. In this first complete English translation of The Path, Matsushita's timeless advice will benefit anyone who desires to lead better by living better. For the first time in English, the complete translation of one of the most popular and important management books ever published. In Japan, the name Konosuke Matsushita is spoken with a hushed reverence. Even now, twenty-one years after his death, Matsushita-san is praised by some as "the god of management," and he remains one of the most influential and inspirational business thinkers ever. Founder and father of the global corporation Panasonic, Matsushita saw the creation of wealth not as a goal or destination but as a voyage. And in The Path, Matsushita shared the wisdom and insights acquired on his journey: how to inspire true innovation at all levels, manage through difficult times, and create lasting value and a great legacy. 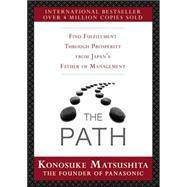 For more than four decades, The Path has been a perennial bestseller, with nearly 4.5 million copies sold worldwide. Presented here in its entirety for the first time in English, this book offers an enlightening and informative spiritual blueprint for entrepreneurs, executives, managers, and anyone who wishes to learn from a great master. Follow The Path. It may lead you--and help you lead others--to professional success and personal fulfillment.